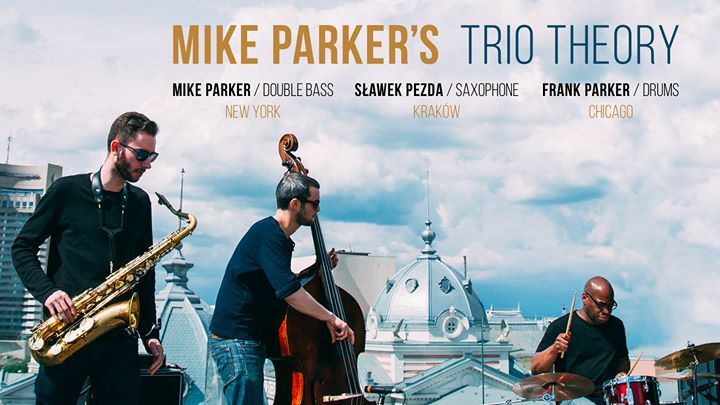 New York bassist and composer Mike Parker is joined by 2-time Grammy nominee Frank Parker (Kurt Elling Quartet) on drums and Krakow, Poland’s fiery tenor saxophonist Slawek Pezda. Together, they take the jazz trio format and inject it with the raw energy of Rock, the sensitivity of Classical, the textural palette of the Avant-Garde, and the rhythmic and harmonic diversity of Modern Jazz. The trio began in November ’14 by completing a marathon tour of 27 concerts in 27 nights. Since then, they have played over 200 concerts across 14 countries from the Baltics to the Balkans including Krokus Jazz Festival (PL), Jazz Festival Praha, Jazz Goes To Town(CZ), MediaWave Festival (HU), Jazzire Festival (RS), Targu Mures International Jazz Festival (RO), Mailaul Festival (EE), and many more. In April ’16 they released Parker’s third album ‚Alive Out There’, recorded live on their Fall ’15 tour. Their Fall ’17 tour will take them to The Netherlands and Germany for the first time to perform at the Mondrian Jazz Festival in The Hague, NL.